On July 15, 1975, NASA launched an Apollo spacecraft carrying three US astronauts. Two days later, on July 17th, this craft docked with the Soviet Union “Soyuz” spacecraft. The Soviet craft had two Soviet cosmonauts on board and the rendezvous marked the first ever international space mission. The “Soyuz” spacecraft was the primary Soviet manned spacecraft since it was introduced in 1967. The docking module used in this mission was designed and constructed by NASA. 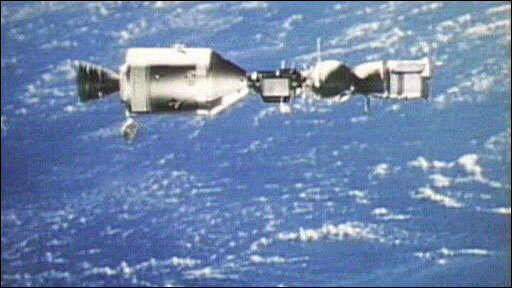 Prior to the Apollo-Soyuz mission, astronauts had never transferred from one spacecraft to another in outer space. The docking modules served as an air-locked corridor that allowed the astronauts to travel between the two spacecrafts. The docking was successful. The U.S. and Soviet astronauts spent two days together, carrying out five joint experiments. At the end of their time together, they exchanged commemorative items. The success of their mutual efforts paved the way for decades of international cooperation in space exploration, and laid the political groundwork which eventually led to the construction of the International Space Station, which began in November 1998. Check out the full story from NASA here.